The electorate does not light his fire. Florida governor Charlie Crist, last seen losing a Senate race, has decided to end his eight-year tenure by officially asking the state clemency board to pardon the Doors lead singer Jim Morrison. In 1970, Morrison was convicted on misdemeanor charges of profanity and indecent exposure and sentenced to six months in jail — it was alleged that he had drunkenly exposed himself after a concert in Miami the year before. He died in 1971, at the age of 27, while he was still appealing his conviction. I’ve decided to do it, for the pure and simple reason that I just think it’s the right thing to do. In some ways it seems like a tragic conclusion to a young man’s life to have maybe this be a lasting legacy, where we’re not even sure that it actually occurred. The more that I’ve read about the case and the more I get briefed on it, the more convinced I am that maybe an injustice has been done here. 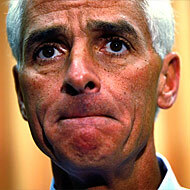 A pardon for Morrison would still have to be approved by members of the Florida Board of Executive Clemency, whose four-member roster includes Mr. Crist. Its final meeting before Mr. Crist’s term expires is scheduled for Dec. 9, the day after what would have been Morrison’s 67th birthday. What’s the deal with southern governors going all bleeding heart for the decades-old minor sins of boomer rock icons? In 2006, then–Arkansas governor Mike Huckabee submitted a pardon request for Keith Richards, who pleaded guilty to reckless driving in the town of Fordyce in 1975.